The Combi Compact ECO RF 30kW gas boiler has been made and manufactured by Intergas. It is a condensing, wall mounted unit which is ideal for smaller homes where space is limited. This is because they do not require an external water tank or cylinder as everything is wrapped up in one cost effective unit. 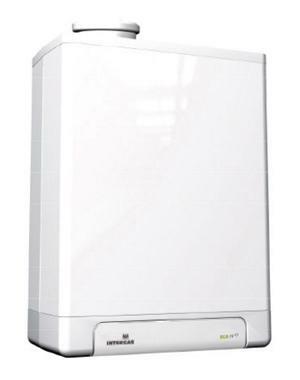 This boiler features a wide range of accessories, benefits and features to achieve its 88.8% efficiency level. It has an output of 23kW which makes the unit perfect for those medium sized homes that don’t have an excessive need for hot water e.g. 2-4 bedrooms and 1 bathroom. This boiler is a unique double high efficiency technology unit and has been awarded the best tested accolade two years running. This boiler has a unique 2 in 1 heat exchanger, condenses 100% of the time and emits virtually no standby losses (<2,0 Watt). With just 12 components and only 4 moving parts there are less parts to service and less opportunity for parts to to fail which should make maintenance easier and improve your boiler’s reliability. It also features an innovative control system and has been built to include a wireless connection to Honeywell wireless room thermostats. This boiler includes 5 years warranty on parts and 10 years warranty on the heat exchanger.